Making exterior home renovations not only increases the "curb appeal" of your home, but also boosts its resale value. Exterior home renovations range from minor changes like adding bushes, trees and flowers to major renovations like adding a deck, fence, repaving the driveway or installing new siding. To decide where to start, it really depends on how much time and money you have to do the renovations. The time factor is moot if you decide to hire the work out and in some cases, like with siding, you have to hire a contractor to do the work. Here is an idea of the estimated Return on Investment (ROI) of certain renovations. Deck: The ROI for adding a new deck is about 104 percent. So, if you spend $5,000 for an average 16 foot by 20 foot deck, the return on the cost of the deck when you go to sell your house is the initial cost of $5,000 plus a gain of $200. New siding: Installing new siding changes the entire look of your house and makes it look like new again. The average ROI for new siding is around 92 percent. 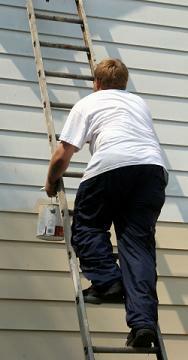 Repainting the exterior: It's a big job, but one you can definitely do yourself with an ROI of 90 percent. Landscaping: Making your lawn and yard beautiful has an ROI of 30 to 50 percent. Remember that returns on investment vary depending on where you live. You don't have to be in the market to sell your home in order to make a few minor exterior improvements. Here are few that will increase the overall value of your home down the road, but also make it look nice. Add a few bushes and trees. Consider adding a few perennial bushes like lilac or forsythia. Perennials are more expensive than annuals but they come back year after year so you don't have to replant every fall or spring. Give your walkways and driveway a good scrub down. Clean oil spills or stains up from the concrete on your driveways and walkways. Paint. Exterior painting gives one of the highest returns on investment. Be sure to scrape and prime first and use a high-quality exterior paint to withstand the outside elements. Replace screen and storm doors. You can purchase storm and screen doors relatively inexpensively from Home Depot or Lowe's. Install new lighting. A single bare light bulb hanging from an old fixture simply won't do. Instead, remove these eyesores and replace them with brand new fixtures. Consider installing motion lights for added security. These home improvements involve more money and time than the minor home improvements and sometimes involve calling in a contractor. Regrade your yard. If a yard has what's called a negative grade, when it rains all the water drains toward the house instead of away from the house, which can damage the foundation of your home. Regrading the yard prevents this from happening. Replace the siding on your home. Calling a contractor is best for this task. It's expensive, but the return is worth it. Choose a neutral color of siding so your house never looks outdated. Install a privacy fence. This is a do-it-yourself task with the help of a few friends and family members. Remember to apply for the proper permits and call to get your underground utility lines flagged before you begin installation. Repave your driveway. You can go with either an asphalt repave or a brand new concrete driveway. Ashphalt you can do yourself, but it doesn't last as long. If you want an all new concrete driveway, you're going to want to call in the professionals. Most people concentrate so much on interior home renovations that the exterior is all but forgotten. Show the outside of your home a little love by making a few renovations on the outside.